As King Solomon says again and again in his Proverbs, prudence and responsible living according to the will of God leads to prosperity. “Get wisdom, and with all thy possession purchase prudence,” he tells us in Proverbs 4:7. That’s advice well taken in today’s tighter lending atmosphere, where the upcoming Qualified Mortgage Rule rewards prudent and frugal borrowers and curtails loans to borrowers likely to fail. The role of major US lenders in the housing collapse and the string of foreclosure abuses that followed have been well publicized. We’ve discussed it in numerous posts here too. Those abuses, among other financial malfeasance, led to the creation of the Dodd-Frank Wall Street Reform Act of 2010, which included numerous provisions designed to protect consumers, to be phased in over the next few years. In line with those provisions, the Consumer Finance Protection Board’s Qualified Mortgage Rule aims to screen out unqualified borrowers with a set of specific criteria. Those criteria are designed to ensure the safely of mortgage loans and prevent defaults due to overlending to marginal or unqualified borrowers. As stated, the standards for a fully Qualified Mortgage require that a borrower’s debt to income ratio be no more than 43 percent, and that fees and points not exceed three percent of the loan amount. 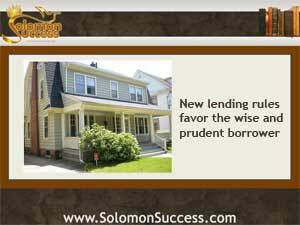 Lenders are also required to verify the borrower’s income. And, with direct reference to the excesses that led to the collapse, no interest only or negative amortization loans are allowed. No mortgages over thirty years are permitted, either. The list of requirements also includes verification of other aspects of a borrower’s credit history and other information. Although the Qualified Mortgage Rule aims to prevent defaults, it’s already being challenged as too strict, barring some marginal borrower from even attempting to get a loan. So, in response to objections from some small lenders and local credit unions. The CFPB relaxed those standards somewhat to allow those smaller lenders to continue making loans that fell outside the QM Rule’s standards. The goal of the Qualified Mortgage Rule is to prevent banks from issuing mortgages to borrowers that are destined to fail – one of the major problems with the freewheeling lending environment that led to the collapse. But, critics say, those very protections may chill mortgage lending and close doors to many borrowers who may be sound prospects but fall outside the guidelines. As provisions of the Dodd-Frank Act continue to roll out, the Qualified Mortgage Rule will become a reality in January 2014, even as lenders and regulators continue to hammer out details. Banks Learn From the Past – and Harm the Recovery?